A friendly reminder that this Friday 2/10 Slowbeer will be hosting a tasting of epic proportions! All offerings are extremely limited brews, many of which no longer available!! Tasting will run from about 5-8pm address: 63 Burwood Rd Hawthorn. Black pour with thin tan head that falls away rather quickly. Nose is very fragrant with quite a bit of dark fruit, also some vanilla and dark roast. Not as brooding as some but certainly ticks all the boxes. Palate is medium bodied with a decent amount of carb (too much?). Tangy roast dominates with raisins as well. Finish is quite restrained & balanced. No doubt this is a good beer (not just presentation but contents above all), however the price $30 for 330ml is pretty ridiculous. Pretty pleased to have tried this & certainly don’t regret having it at such a young age. Pours black with not much of a head. Nose has a heap of coffee, dark liquered fruits & roasted malt with the high abv attributing a slight spirity character, also a touch of smoke. Palate is pretty thick and mouthcoating as you would expect from the 16%abv. Coffee is integrated with the dark malt really well & while dominating it certainly doesnt stick out of place. Finishes quite prickly and slightly numbing on the tip of the tongue, aside from that abv is handled really well. Suprised this isnt a whole lot sweeter, which is definately a pleasant surprise showing great balance. Highly recommend, despite hefty price! Just shy of it's first birthday. And I think it's a better beer now. The shackles are coming off and the palate is starting to open up with more obvious chocolate and less astringency. That said, there's still a firmness to the 'fruit' (think bitter chocolate) which bodes well for further aging. I'd hve no hesitation leaving for another 2 years. Tasted on release. Fantastic looking beer (as most Imperials tend to be) with a choc orange creamy head. Thin but effective. Nose shows some chocolate sweetness, hints of licorice and a touch of roast. All quite elegant. Flavours definitely get better as the beer warms up and you could just about drink this at room temperature. Sweet malts very early, then a slightly weird tangy lemon kick, before the palate slips into dark bitter chocolates. Good length. Flavours are relatively tight and I think this beer needs a couple of years in the cellar. Another encouraging result from my modest cellaring efforts on this beer. I actually did not try on release but did sock a 750ml away for 12 months. So, no reference point but this beer looks good. Relatively mild for a DIPA across both the nose and palate. Pours with a massive foamy head that takes forever to quit. Nose shows sweet hops and some lower key sweet malts. Hops are quite settled to taste and don’t really bite at all - impact from the aging perhaps? Quite resiny. There’s also a very interesting funky brett-like character (ie dirty wine like) that kicks in the back palate. The intensity backed off late, sapping my confidence that this beer will benefit from any further extended cellaring. A minor cellaring experiment with a now 14 month old. Glowing oranage in colour and a large fizzy white head. Aromas are really something else: rich apricot, sauturnes, spice and aniseed. Very deep. Palate shows the apricot early beofre some fizz and alcohol-driven aniseed / licorice kicks in. The latter characters are quite pro-nounced. Finishes a little rough and bitter. Cellaring hasn’t hurt this wine at all but the alcohol is a little abrasive. 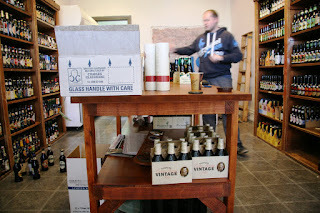 The cork removal process was an absolute bugger just like the Anniversay Ale!! Very expressive and perfumed nose; fruity esters, sweet grapefruit, soft floral characters, and perhaps a faint sugary note. The flavours are a bit more straight forward and the palate, in the early stages, is driven by a sweet malt that transforms into fruity flavours that progressively thicken. Finishes with a touch of heat and bitterness that appears alcohol driven, but that said the near 9% weight is well managed. To my tastes has more in common with the recent double IPA style releases from fellow Oz micros, rather than a abbey tripel. Whatever, I think this beer is interesting and well worth a try. As promised this Friday 25th we will be having a little tasting to celebrate our opening. It will run from 5-8pm and all are welcome. Given that it will be Grand Final eve, what better reason to swing by for a celebratory beer & a chat! Our shop is located at 63 Burwood Rd Hawthorn. The following Friday 3rd October, we will be having another tasting, this one much larger than the first! For us, these tastings are a celebration of all our hard work so we’re bringing out some great beer & hope to see some familiar faces as well as make some new beer loving friends! Well, as always we’ve been flat out endeavoring to bring you the best craft beers around at the best prices. While we have a heap of new arrivals & fresh stocks the purpose of this email is to let everyone know that SLOWBEER IS FINALLY OPENING. Yes, after a couple of months of hard work the store is now looking great & ready to go! We’ve decided to avoid fanfare and allow time to iron out any operational kinks by opening the doors for the first time on Sunday afternoon! All are welcome to pop by and see what we’ve been up to for the past 2 months! Now, as promised next Friday 25th we will be having a little tasting to celebrate our opening. It will run from 5-8pm and all are welcome. Given that it will be Grand Final eve, what better reason to swing by for a celebratory beer & a chat! While, you may be thinking that we’ve gone back on our promise of a grand opening & tasting, not so. The following Friday 3rd October, we will be having another tasting, this one much larger than the first! However, for our many interstate customers I suppose its business as usual. While we’ve already had a scand-invasion, its time for a KIW-INVASION! The below breweries are being added to our ever growing range of world-class Kiwi craft breweries. Additionally, we have some new releases (& fresh stocks – see web) from some of our most popular breweries. Please note that all Slowbeer matters will now be handled exclusively by Slowbeer. For all questions & queries please email sales@slowbeer.com.au or hop online to place your order. I know we keep saying '2 weeks' but this time I feel completely comfortable saying 'this weekend'! As you can see from the photo we are nearly ready to roll and Chris has done a great job of getting some cracking beers on the shelf. Once we iron oout any operating 'kinks' we'll be focussed on a few celebratory opening nights for the Melbourne beer geek community. Stay tuned! Ok, so we've been a little quiet lately, gearing up for our Slowbeer store opening so no doubt all is forgiven. We are officially only a fortnight or less away from a Grand Opening/Unveiling, so its all pretty exciting! Rest assured, we will inform everyone of the time/date of our opening so as to ensure that nobody misses out. We have a heap of awesome beers on the shelves as well as some great specials (as if our prices weren't already the best!) & a smorgasbord of delightful (old & rare) beers on tasting! So to whet your appetite, try this on for size! As the name states this is a breakfast beer...of sorts. Oats & coffee in an imperial stout, it makes sense to me! Though I wouldn't be having this one at breakfast, for obvious reasons. Pours deep dark black with a hint of brown around the rim, huge fluffy tan coloured head. Nose has a heap of dark roasted malt, but not appearing astringent as some coffee beers do. The malt is perfectly rounded, some sweetness, some honeycomb, a touch of smoke & of course the coffee, oh the coffee! Palate has surprisingly lively carbonation, not over the top but a touch more than i expected. Much like the nose, the malt is so well rounded. Has a bit of everything with the coffee standing out, but not overpowering. Finishes with rich coffee notes, but in no way astringent. Lively carbonation dries it up a touch as well. Hops are there, but play second fiddle to the well controlled yet dominant coffee notes. Awesome beer! Clearly alot of thought has gone into the malt selection (pils, cara-munich, smoked, brown, pale chocolate & chocolate) and it has paid off. I cant wait to try the weasel, though i hear it tastes like poo...and by poo i do actually mean poo, albeit super expensive, super rare coffee laden poo...or is it poo laden coffee? Still, i cant say i'm going to shy away!